Banks have been behind the curve in terms of downsizing, with their employees paying for it now through a rash of furloughs, analyst Meredith Whitney told CNBC. The industry has seen a recent spate of big layoff announcements, including 16,000 from Bank of America [BAC 8.83 -0.14 (-1.56%) ]alone. Though banks already have jettisoned about half a million workers since the beginning of the financial crisis in 2008, Whitney said more are to come as the shrinking big institutions struggle to compete. New banking regulations, particularly the Dodd-Frank financial reform bill, have seen the banks shrinking in order to avoid the too-big-to-fail syndrome that caused the industry to push the country into recession. Whitney said the newest Federal Reserve quantitative easing program in which the central bank will buy $40 billion a month of mortgage-backed securities will help housing-sensitive businesses like Wells Fargo [WFC 34.53 -0.23 (-0.66%) ] and the mortgage service industry. 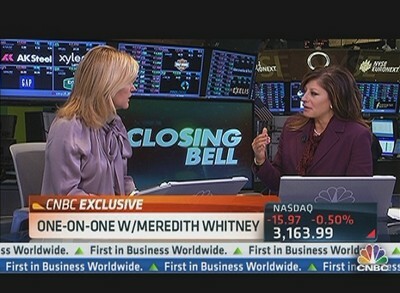 In another matter, Whitney again defended her call on municipal bond defaults, even though they have yet to happen on near the scale she predicted during an appearance on “60 Minutes” in late 2010. During a recent CNBC appearance, Whitney critic Alexandra Lebenthal, head of Lebenthal and Co. in New York, said munis remain a safe investment.